The U.S. Marine Corps in early March 2018 asked the defense industry to provide information on a versatile new unmanned aerial system that could replace the Corps’ aging EA-6B electronic-warfare planes and complement existing surveillance, cargo and attack aircraft. Recognizing our current recapitalization toward a more diverse, lethal, amphibious and middleweight expeditionary force, the Marine Corps requires a UAS that is network‐enabled, digitally interoperable and built to execute responsive, persistent, lethal and adaptive full-spectrum operations,” the Corps’ 2018 aviation strategy document explains. The Marine Air Ground Task Force Unmanned Aircraft System Expeditionary program — MUX, for short — aims to field the new drone starting in 2025. 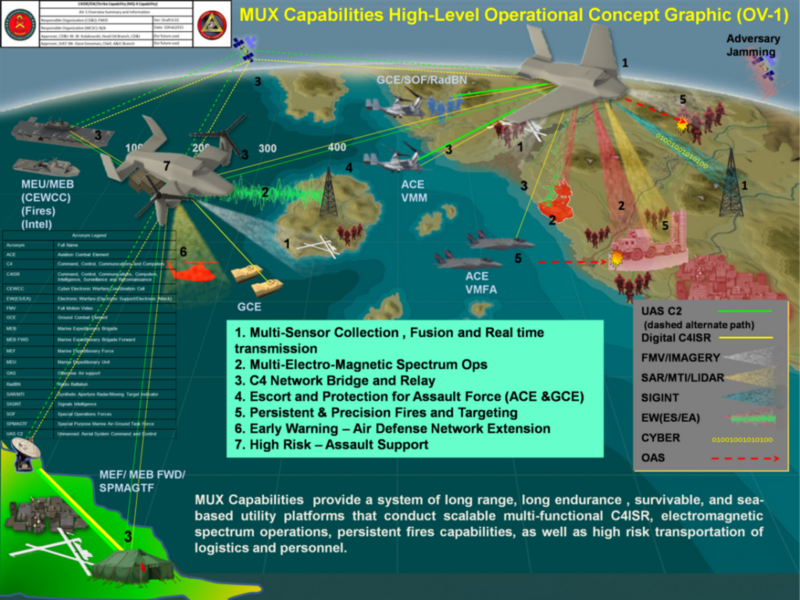 “There is a need to close battlespace-awareness; electronic warfare; command, control, communications and computers; logistics and kinetic lethal fires gaps in aviation capabilities,” the official request-for-information for MUX states. The drone must be capable of speeds between 200 and 300 knots while carrying a 3,000-pound payload to distances between 350 and 700 miles. Perhaps most critically, the new vehicle must be compatible with a wide range of amphibious vessels, including America– and Wasp-class assault ships and smaller San Antonio-class landing docks. That means MUX will probably need to be capable of vertical takeoffs and landings. The drone should be roughly as large as a UH-1Y helicopter, according to the RFI. The Marines’ most urgent need is for a new aircraft to conduct early-warning, surveillance, electronic-warfare and communications relay, the information-request explains. The Corps’ last two squadrons of land-based EA-6Bs are due to decommission in 2018 and 2019 after four decades of service, leaving the branch without a dedicated radar-jamming plane until MUX enters service. The Navy’s EA-18Gs, which replaced the sailing branch’s own EA-6Bs, are too big to take off on the assault ships’ 850-feet-long decks. The Marines have long sought a multi-role aircraft to round out the air components that embark on assault ships, giving the vessels many of the same capabilities as the Navy’s carrier air wings with their fighters, jammers and early-warning planes. New F-35s, UH-1Ys, AH-1Zs, V-22s and CH-53Ks — all of which take off and land vertically — can provide Marine wings with robust attack and transport capabilities. But the wings lack shipboard aircraft similar to the Navy’s E-2 radar planes, which like the EA-18Gs take off and land conventionally and thus are incompatible with assault vessels. MUX could become a kind of poor-man’s E-2 and EA-18G, but for assault ships instead of full-size supercarriers. The Marines also want the new drone to be compatible with lightweight weaponry so that it can conduct “all-weather, persistent, time-sensitive-targeting and strike, high-value-target attack … and kinetic, lethal, offensive air support,” according to the RFI. MUX could also haul cargo to aid in the “distribution of ammunition, water, rations, repair parts, fuel, medical supplies, mail and other commodities,” but this mission is a lower priority and the Marines “may allocate [it] to other systems,” the RFI states. The Corps’ aviation strategy identifies two leading candidates for MUX. Northrop Grumman and the Defense Advanced Research Projects Agency are developing Tern, a propeller-driven, flying-wing-style drone that takes off and lands vertically. DARPA has funded two Tern prototypes. The agency announced that Tern would fly for the first time in late 2018. The other candidate is Ares, a joint effort by Lockheed Martin and Piasecki Aircraft “to develop the next generation of compact, high-speed vertical-takeoff-and-landing delivery systems,” according to Lockheed. Ares features so-called “ducted fans” — in essence, rotating propellers embedded within the wing. 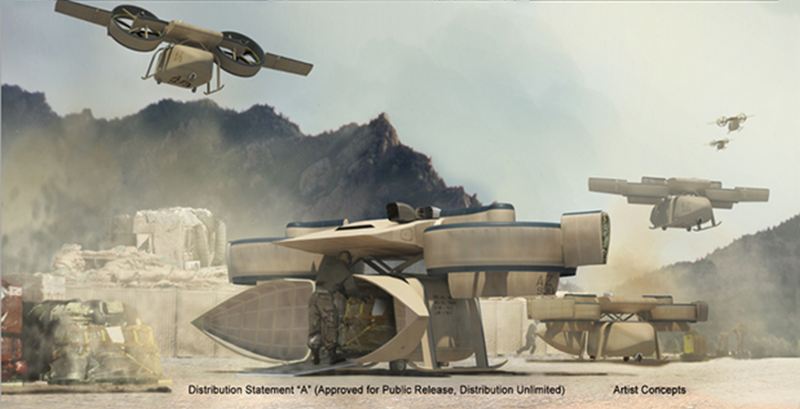 The companies originally intended Ares to perform a transport mission, but Lockheed claims the vehicle could also carry a module containing surveillance gear. Ares has been in development since 2009 but has yet to fly as of April 2018.